"We have an important task for you…" HBO has launched a full-length official trailer for Ramin Bahrani's Fahrenheit 451, a new feature film adaptation of Ray Bradbury's seminal work about a dystopian book-burning future America (which was made into a film in 1966). Oh my does this look good, and frighteningly accurate in relation to what's currently happening in America. This version stars Michael B. Jordan as Guy Montag, a young fireman who struggles with his role as a law enforcer. The full cast includes Michael Shannon, Sofia Boutella, Keir Dullea, Chris Gleason, Martin Donovan, Lilly Singh, Grace Lynn Kung, Joe Pingue, and Sean Jones. I am so, so in for this and can't wait to watch the entire film. Trust in Bahrani! He's a great filmmaker, and I have a good feeling he's made one of his strongest yet with this film. You can also still watch the first teaser trailer for HBO's Fahrenheit 451 here, for a bit more footage. Fahrenheit 451 is based on Ray Bradbury's classic novel. In a future where the media is an opiate, history is rewritten and "firemen" burn books, Jordan plays Guy Montag, a young fireman who struggles with his role as law enforcer and with his "mentor", played by Shannon. Fahrenheit 451 is directed by acclaimed American indie filmmaker Ramin Bahrani, of the films Strangers, Man Push Cart, Chop Shop, Goodbye Solo, At Any Price, and 99 Homes previously. The screenplay is also written by Ramin Bahrani, with Amir Naderi, adapted from Ray Bradbury's novel of the same name - first published in 1953. 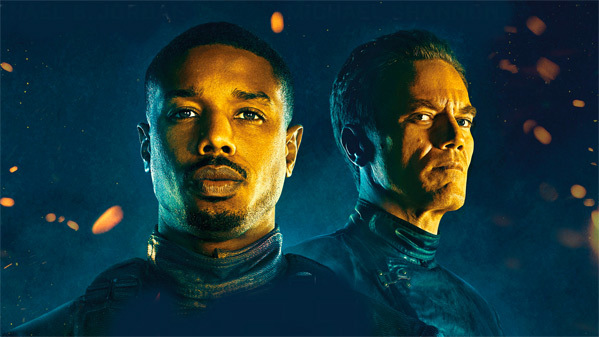 HBO Films will be releasing Ramin Bahrani's new adaptation of Fahrenheit 451 exclusively on their service starting May 19th this summer. Visit HBO for details and info on how to watch. How does it look? Who's planning to watch?